Wasdale Mountain Rescue Team Incident call-outs. See why it's safer to do your mountain challenge with experienced guides. We specialise in organising charity fundraising events, in the mountains and open spaces of the UK and Ireland for small or large groups and individuals. We also provide mountain skills training, navigation training and many leisurely walks in some of the most dramatic and beautiful locations in the UK and Ireland. Whether you are looking for a challenge to raise funds for a deserving cause, want to learn some navigation or simply want to enjoy the scenery, we have something for you. The three peaks challenge makes a great fund raising or team building challenge but we have many other challenges to offer as well as more leisurely mountain walks and long distance trails. The Three Peaks Challenge and the Yorkshire Three Peaks Challenge are just two of our most popular mountain challenges. They are suitable for charity fundraising events, corporate team building events or just for fun with a group of friends! If you want an alternative to these, have a look at our Lake District 10 Peaks Challenge. It's as tough as, if not tougher than the 3 peaks challenge. We consider it our 'environmentally friendly' alternative to the three peaks challenge. If you want an even tougher challenge, have a look at our Lake District Top Ten Challenge - that one's tough! Based in Cumbria we have many challenges in the Lake District that are every bit as tough as the National Three Peaks Challenge and some even tougher! We also offer much more leisurely walks allowing you to enjoy the mountain environment and savour your surroundings.To prepare for your challenge we also offer Three Peaks Challenge training, and Yorkshire Three Peaks Challenge training events. We also offer a ladies only option for most of our challenges. 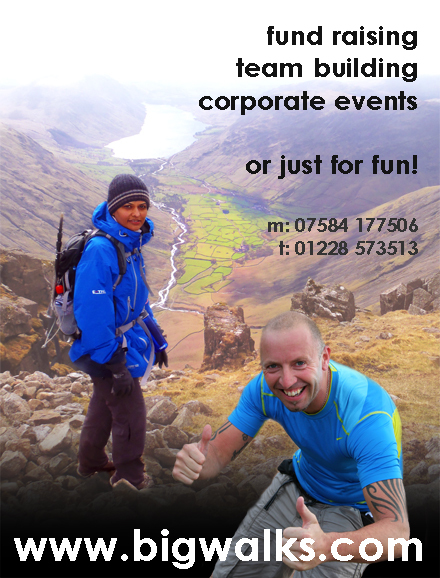 All of our mountain challenges make excellent team building exercises and charity fundraising events. Most of our featured challenges can be completed in 24 hours but multi day events can be arranged - the choice is yours. We don't just do challenge events, we also provide navigation training and mountain skills training. If you're organising your own challenge event why not book a navigation course - map and compass skills are essential for anyone venturing into the mountains. 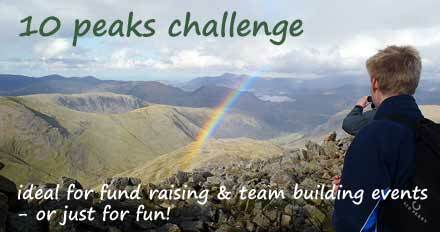 Have a look at our three peaks challenge training page or our three peaks challenge FAQ page for further information. Why choose Bigwalks Mountain Adventures? We have the knowledge and experience to ensure you get maximum enjoyment from your chosen challenge or event and complete it safely. We aim to provide a quality service tailored to your budget requirements and aspirations. All our guides and staff are qualified in the activities they lead with up to date first aid qualifications. On the mountains our guides carry safety equipment such as emergency shelters, first aid kits, radio's etc. For mountain challenges we operate a ratio of 8:1 and our guides accompany you throughout the whole of the challenge as opposed to acting as 'marshalls' pointing the way at various locations on the mountains. Where an event involves driving long distances, such as The Three Peaks Challenge, we provide dedicated driver(s) to ensure maximum safety on the road and only use reputable transport providers well known to us. We have robust health and safety policies in place that are reviewed regularly and risk assess all our activities. We will be happy to provide you with any information you wish regarding safety issues.